He did stay in a madhouse for a while. 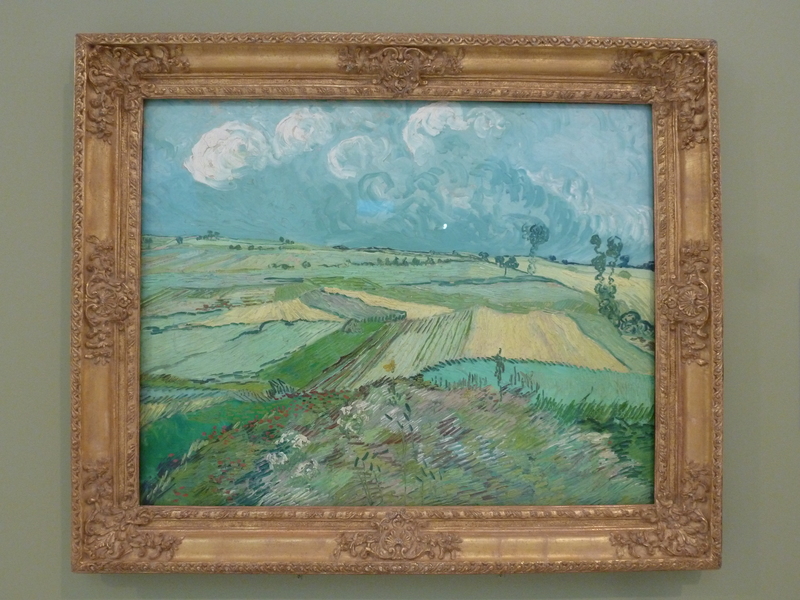 In walking through our local art museum, I came across this van Gogh painting. While I was admiring his brushstrokes, I started hearing the Madness song by Muse play in my head. Was this clairaudience? I know it is a popular song on the radio right now, but I thought it was interesting that I heard it while looking at his painting. His brush strokes are pretty fast and thick with paint. He was known to strive to paint one painting a day. I do not think that makes him mad, but purportedly getting into a fight over a women and losing an ear … well? Was he mad? I cannot say for sure. I have been told that the best Dr. Who episode involves transporting van Gogh into the future to show him that his paintings are famous. The look on his face was priceless. This entry was posted in Art, Metaphysical, Musings, Philosophy, psychic and tagged Carnegie Museum, clairaudient, Dr. Who, intuition, Intuitive, Madness, Muse, Painting, Vincent van Gogh, Wheat Fields after the Rain. Bookmark the permalink. If he was mad then I want some of it! I love that song, haven’t heard it before. I don’t listen to the radio or watch tv.. Yes, I want the drive to paint each day too… it is relaxing. I am glad you like the song. I don’t watch a lot of tv (pretty rare) either, but I do enjoy listening to music in the car… I like that he sings, “I have finally seen the light” even though there appears to be madness in the world. ~Smile~ Yes, to anyone that has not seen the “Doctor Who” episode, you simply must watch it. It shows Van Gogh, as a human being, in a way I imagine most don’t think of him. When he is transported ahead in time, to see what he contributed to the world, to see how he effected the future, he finally sees himself, in a way he has never before. I never tire of watching that episode. Hello Kim! I found a good YouTube of it!!!! And added it to the post. It makes you want to tear up for sure. Awesome good feeling… love his starry night. I also had not heard that song yet, but I enjoyed it! I am a strong believer in spirit sending messages through song lyrics in our heads. It happens to me often, and when I think about what life circumstances I am in the midst of, it usually is quite fitting and helpful. Hello Alethea! I wish I had known long ago that the songs that pop into your head have a meaning behind it. I certainly pay attention to them now to see how it relates. They almost always make sense. I want to add an update to this post…. I recently revisited the Carnegie Museum and read that this was one of his last paintings. He purportedly committed suicide, but some believe he was murdered. Still, either way, he was very sad at this point in his life.